I’ll admit, it hasn’t exactly been a smooth year for me when it comes to fiction and humor. Excitement over highly anticipated satire and parodic works have mostly fizzled after finding out they are in fact not what I had in mind. Undeterred though, I decided to leap next into The Dragon Lords: Fool’s Gold, intrigued by its “Guardians of the Galaxy meets The Hobbit” tagline and hoping against hope that I’ll finally get the fantasy comedy I’ve been searching for. The premise sounded promising enough, featuring a tale about an unlikely band of adventurers who’ve gotten it into their addled heads to rob a dragon. Before everything in his world turned upside down, Will Fallows was just another unassuming farm boy from a poor little village (literally called, The Village…the people are too downtrodden to be inspired) in Kondorra Valley, doing his best to make ends meet. However, each year the rising taxes demanded by the Dragon Consortium makes it that much harder to do, until one day, the moment that Will has been dreading all his life finally comes. With no warning at all, the dragon lord Mattrax’s soldiers show up at his door to seize his farm. Left with nothing to his name, Will suddenly finds himself in the company of two traveling mercenaries, the skilled fighter Lette and her partner the eight-foot-tall lizard man Balur. After recruiting the help of a magically gifted university scholar named Quirk and an old drunkard named Firkin, the five of them conspire together to hatch up a plan to get revenge on Mattrax, the dragon who has been the cause of so much pain and suffering to the humans of the valley. It’s a totally crazy, stupid idea, one that Will knows has almost no chance of success. If they fail, they’ll bring doom upon all the people of Kondorra, and possibly to the world beyond. But if they can somehow pull this off? They’ll all be rewarded with riches beyond their imagination. The promise of gold beckons, and who knows, maybe this time fortune might actually favor the foolish. Main reasons to check out this book: 1) if you think you’ll enjoy an epic fantasy seen through a modern humorous lens, and 2) if you’re like me and have a fondness for a good heist story. Many times throughout this one, I was reminded of Patrick Weekes’ Rogues of the Republic series, which contains a similar amount of humor, action, snappy dialogue, and creative solutions to unusual problems. Jon Hollins takes the zaniness further though, often putting his characters in ludicrous situations whenever things go wrong—and things actually do go wrong a lot in this story, despite our heroes’ careful planning (or rather, what they naively believe passes for careful planning). But hey, who wants to read about a heist that goes off without a hitch anyway? In this quirky tale, it’s the infighting and the unforeseen circumstances that makes things so entertaining. Now for the reasons why you might want to take a pass on this book. If you like full immersion into a world, then this would not be for you. The Dragon Lords: Fool’s Gold is unabashedly tongue-in-cheek, with exaggerated characters and situations. It’s all done very cleverly, but it’ll be tough to get on board if you already that know fantasy comedy isn’t your cup of tea. Hollins is generous with the use of anachronisms, pop culture references and modern slang, but mind you, these are features, not defects. One only has to take a glimpse at the chapter titles to see what I mean, with hilarious headings like “We’re Going to Need a Bigger Boat”, “What’s in the Box?”, “Hubris is a Dish Best Served Charbroiled”, “Lying Liars and the Lies They Tell”, “The Inevitable Cliffhanger Chapter” and many, many more such examples. It’s meant to be pure fun, and pure fun is what you get. It’s also relatively light fare, which is to be expected. For humor fiction, the book might have run a little longer than I was happy with, but that’s really my biggest criticism, which is in no way a deal breaker in the greater scheme of things. For the most part Hollins does manage to keep the story moving along at a quick pace. Audiobook Comments: I was also fortunate enough to be given the opportunity to listen to the audiobook edition, and it confirmed one of my long-held suspicions: humor works splendidly well in audio format! Narrator John Banks with his smooth accent and deep tones seemed like an odd choice of reader for this book at first, but I quickly came around. In fact, I think his serious, earnest style only emphasized the humor. More importantly, his performance also moderated some of the more absurd situations for me, whereas if I’d actually been reading the words on a page, I think I might have rolled my eyes at the same scenes. He’s also great with voices, and even his exaggerated ones for characters like Balur or Firkin somehow sounded completely natural and in keeping with their personalities. Overall, I would highly recommend this audiobook. 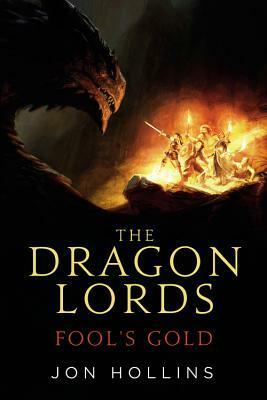 Bottom line: The Dragon Lords: Fool’s Gold is clever, adventurous and entertaining. If you’re looking for a light read with a fun plot and interesting characters, you won’t be disappointed. I’ve been looking for a light humorous fantasy and this one sounds perfect! The description didn’t do anything for me so I hadn’t looked into it but I love those chapter titles! Thanks for bringing this to my attention. Hmmm… I am guessing this book might not work so well for me 🙂 I am just so picky about humor, it makes me feel like a stodgy old, no-fun, uptight …. whatever. But yeah, from what you’ve said I see it going south for me quick. Yeah, I could tell this wouldn’t be for you within the first few chapters, because I know how you prefer your humor 🙂 Nah, you’re not uptight or stodgy, we all just have different tastes! Sounds quite good – I especially like the suggestion that if you like Weeke’s then you might like this. I still have No3 of his series to finish. I will keep this in mind – it sounds fun but I just won’t rush into it as I’m trying to get on top of my books at the moment and being careful.